For those of you who follow me on Facebook Click this link to be taken to my page, it will be no news to you that as usual things have been quite eventful in The Myasthenia Kid household again. Makes a change doesn’t it? The week before my trip to Plymouth, hubby took Willow to the vets as over the last year she has developed a lump in the centre of her back that had started to grow quite rapidly. It had been checked out in June by the vets and we were assured all was ok however due to its increase in size and the fact she was losing fur where the lump was it had started to worry us. The vet who examined Willow said that the lump would have to be removed and that he was more than certain it was a lipoma (a fatty lump). 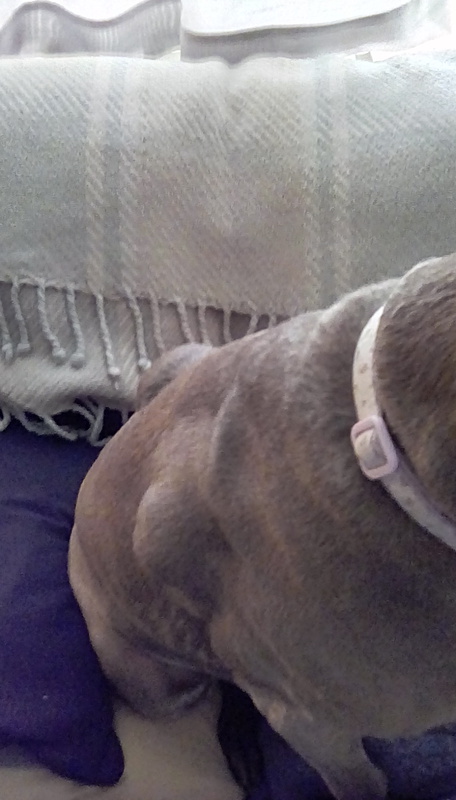 The lump on her shoulder (which we had been told for years was where her microchip had migrated and scar tissue / a cyst had formed) had also grown larger, so whilst her lipoma was removed they would also remove this lump. As you can see from the above photo they were sizable lumps and had been checked regularly. However every time they were checked the vets informed us there was nothing wrong and to remove them would be purely for cosmetic reasons. Willow’s surgery was booked in for the Thursday of the same week. Jay and I weren’t looking forward to this as Willow reacts very badly to general anaesthetic, it’s not in a dangerous way but it is distressing for her and us. Basically she is out of it for hours with eyes like saucers. From the minute she comes around she cries / howls / barks and can’t be comforted. Each time she has had to stay at the vets she has come home hoarse. So this time we told the vets that she would be coming home as soon as she regained consciousness, this was to protect their ears and to limit the amount of stress Willow would be under. Willow was dropped at the vet’s between 8:30-9:00am as requested. We had been told that to keep her calm they would sedate her whilst she waited for her operation. She had initially been first on the list but was bumped to second when an emergency came in. At 12:30pm I received a call from the vet, my heart was in my mouth, with Willow having breast cancer in January this year and having lost a family dog to G.A when I was 16, you can just about imagine the thoughts rushing through my mind. 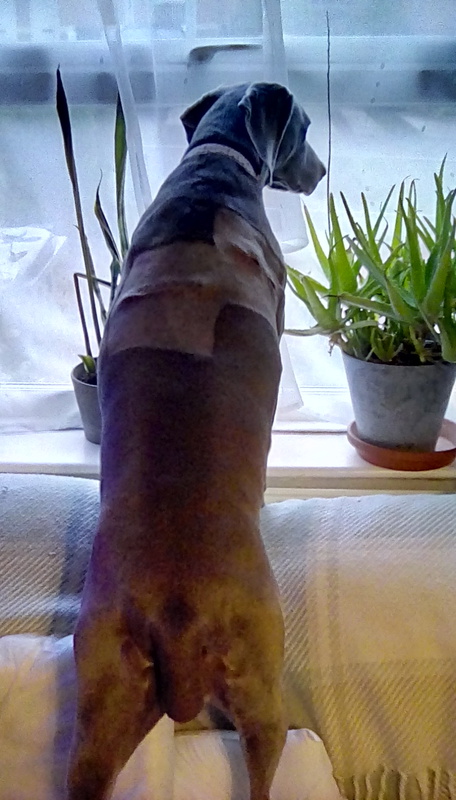 The vet who was doing the operation had discovered another lump near Willows front leg and wanted to know should she remove it whilst Willow was on the table. I gave the ok but was perturbed when the vet then added that should any of the lumps look suspicious they would send them off for a biopsy. The first vet to see her had been sure they weren’t anything sinister and now the second vet seemed to have a different opinion. I wouldn’t know what they found until they rang to let me know she was awake and had made it through the operation. I didn’t get a phone call until 15:00, the operation had been a long one. Thankfully all the lumps had been fine and exactly what they were expecting, two cysts and one lipoma. However the microchip was not in the lump that was in her shoulder, that was safely in the correct position at the back of her neck. So the cyst had formed either through an injury or just because that is the way things go. The lipoma that had been removed was the size of a small orange and was at the point of rupturing, which would have been a nightmare should that of happened. Willow was already crying even though she was barely awake and we were told that we could collect her at 16:00. I was so relieved, I called hubby as he was at work, which must have been awful for him. He told me he would be there on the stroke of four to bring her home. I could hear Willow howling in the car as hubby reversed onto the drive. It was going to be a long 12 hours as this is how long her adverse reaction goes on for. When you are well, looking after a sick pet can be exhausting when you are already chronically sick yourself looking after a poorly pet is beyond tiring. I wasn’t quite prepared for the sight that greeted me. I will be honest she looked like she had been butchered. She was covered in blood and the stitches had a look of a Sunday joint of raw meat about them. She was happy to be home, even if at this point she was a space cadet not really knowing what or where home was. I suggest if you are easily made queasy scroll really fast past this photo. To say I was shocked or even we were shocked at the state of her would be a massive understatement. I don’t think either of us had prepared ourselves for what she would look like returning from the vets. Jay (hubby) had to dash back to work and it quickly became evident that if I didn’t sit and cradle Willows head constantly, whilst talking to her to reassure her that she was ok, she would start to howl. I couldn’t even make phone calls without her starting to cry. She was ravenously hungry when she came home so she had some tinned food that the vet supplied us with. On her discharge notes it said she wouldn’t be hungry until the next day. The person that wrote these notes has obviously never owned a Weimaraner. Every time one of mine come home from the vets the first thing they do is head to the kitchen to see what poorly food they can have. Willow also refuses to sleep when she comes home and fights against the sedation. I gave up sitting downstairs and went to bed with her cuddled up against me. I managed to quieten her down but every few minutes she would start crying quietly again. It’s awful to see her in such a bad way and not being able to completely comfort her. As the hours ticked by (rather slowly) her pupils came down in size and she started to be with it a little more. She is also desperate to go out for a walk when she gets home, so it was excellent timing that hubby was on a late night as they wouldn’t be getting an evening walk. Frankie and Mollie were excellent around Willow. There was no play fighting or jostling for cuddles like there normally is. To say they were giving her a wide berth was an understatement. 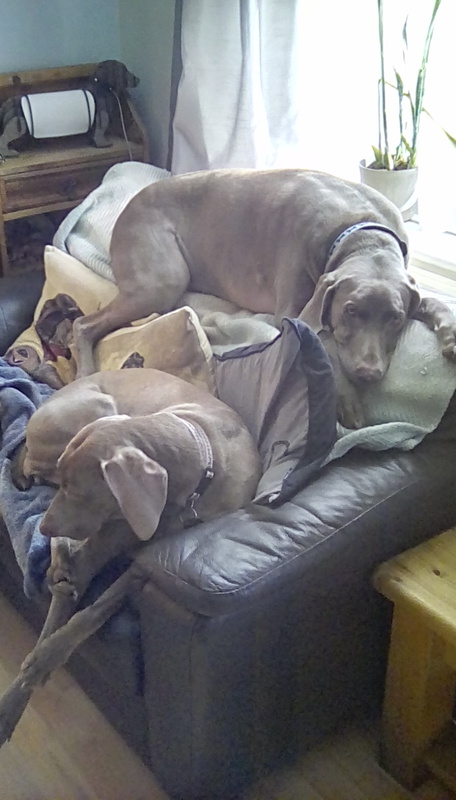 When I took this photo of Frankie and Mollie, Willow was with me on the big sofa. They’ve never shared the small sofa like this before and haven’t again since Willows stitches have come out. That’s Frankie at the top of the sofa and Mollie underneath. Willows first appointment back at the vets was booked for the Saturday morning, it was a simple wound check and by the Saturday Willow although feeling very sorry for herself (and who can blame her) had got over the GA. The vet was very happy with her progress and gave her wounds a clean so that she was no longer covered in blood. Her wounds were starting to dry up and scab so the oozing was very little. However what there had been in those two days had been significantly more than we were expecting and we have seen her through quite a few operations. We knew when Willow was feeling back to normal when she nicked Frankie’s dumbbell. This is something she always does. 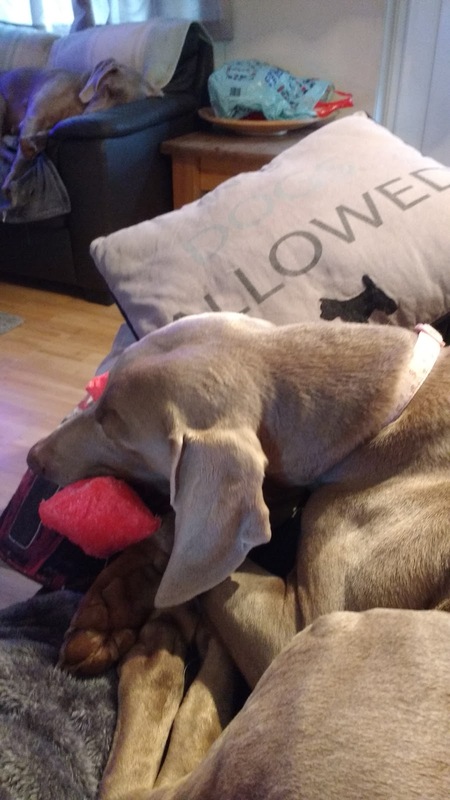 Sleeping with it in her mouth so that he can’t get it back until she says so. The next worry was the fact my appointment in Plymouth would mean I would have to leave her. Had I not desperately needed to see my new consultant I would have happily cancelled. I left our poor dog sitter with a two page sheet of A4 list of instructions including telephone numbers to cover any eventuality. 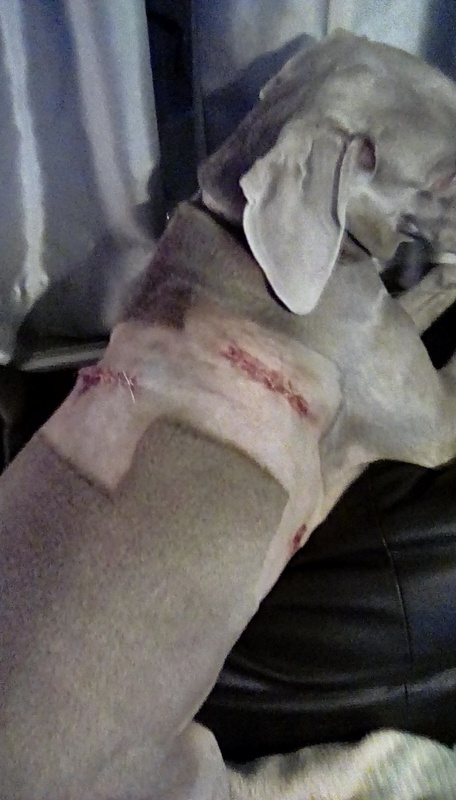 Due to the position of Willows wounds nothing could be done to prevent her from scratching and inadvertently pulling the stitches out. This would be the worst case scenario and we would be an hour away in Plymouth. As it was Willow was absolutely fine on Tuesday but decided to rip a stitch out on Wednesday when we were home. Bloody dogs! So an unexpected trip to the vets ensued. Thankfully the vet was happy that the stitch didn’t need replaced but as a precaution as the whole wound was looking red and raised she was placed on antibiotics. 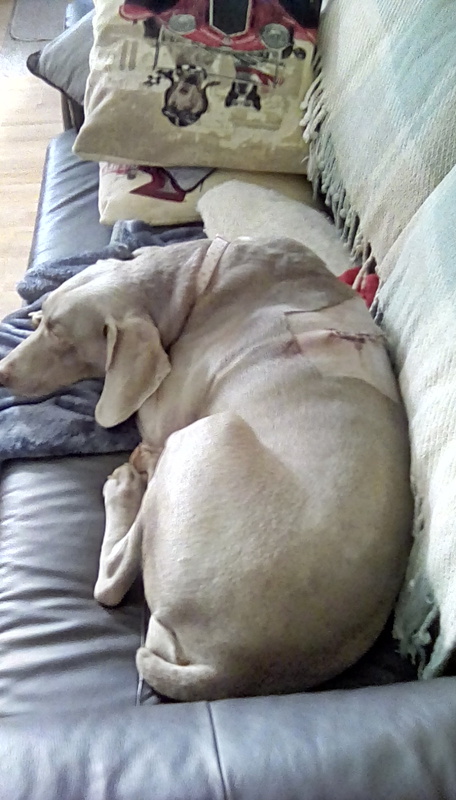 Thankfully this Monday (14th Dec 2015) Willow had all her stitches removed. 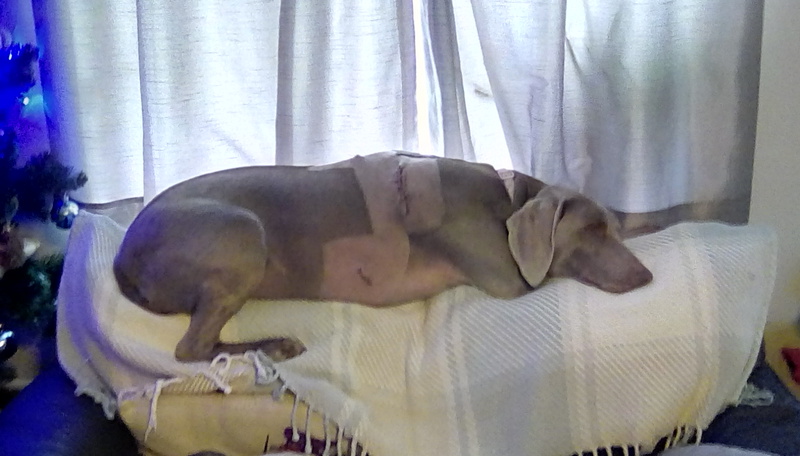 We had been warned by the vet last Wednesday that due to the infection, the shoulder wounds stitches may have to be left in for a few more days. 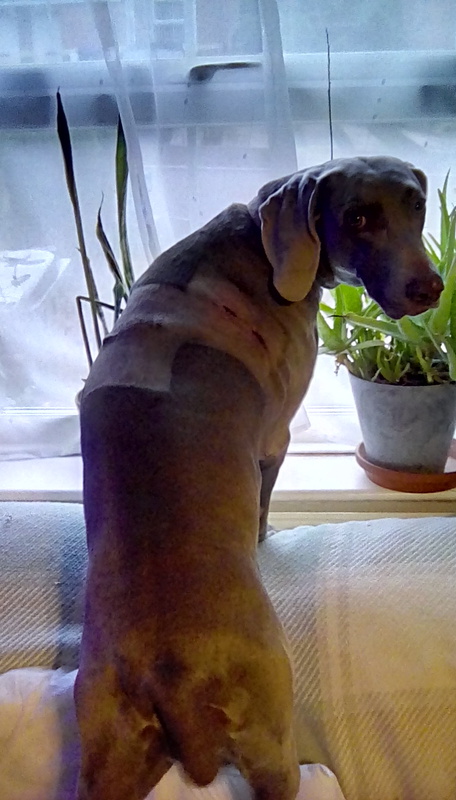 We tried everything to stop her scratching, dressings – they fell off in one shake, a sock on her back foot, taped on – they were found in all sorts of places including the back garden. Since her stitches have been removed she hasn’t scratched at all. Now I keep finding great chunks of scab on the floor but it is all healing nicely. Now just need to start a go fund me page to cover the vets bill as not all of it was covered by insurance…………….